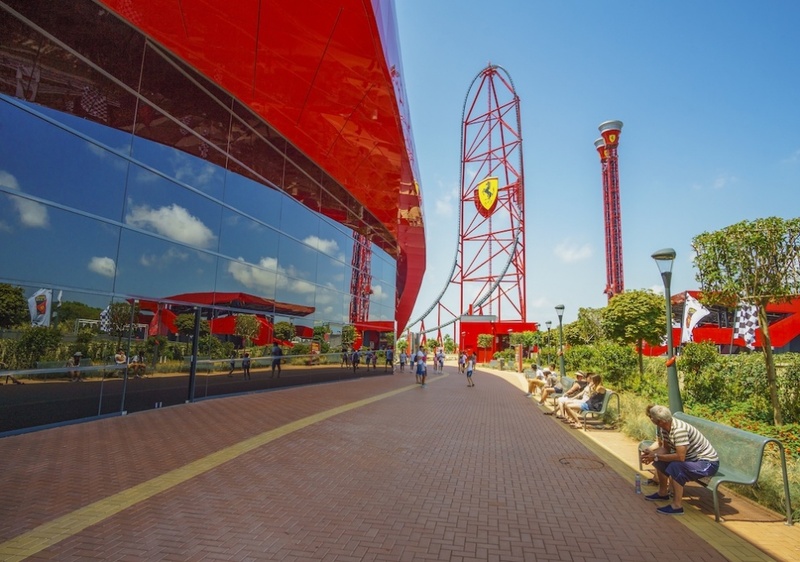 Ferrari Land theme park in Spain was officially opened to the public on 7th April ’17 by Arturo Mas-Sardá and Piero Ferrari. 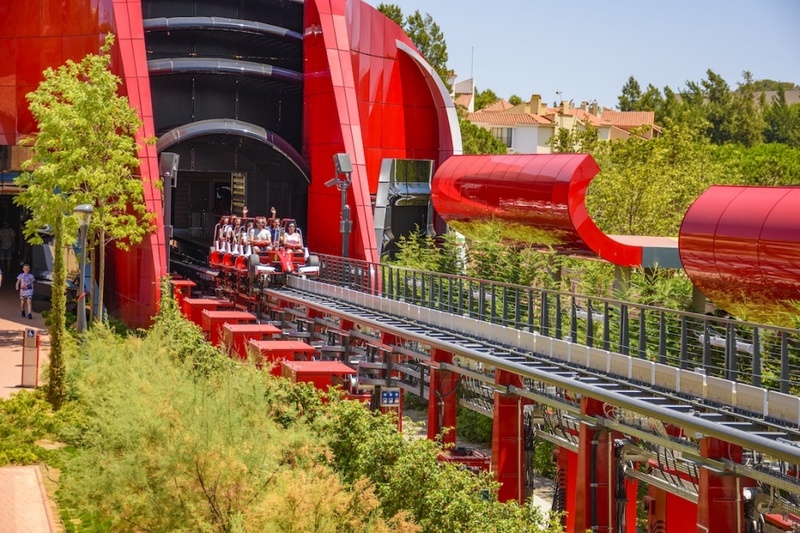 It is the third attraction to open at PortAventura World Parks & Resort, located in Salou, about an hour by car from Barcelona. This impressive new 70,000 m2 themed attraction captures the spirit of Ferrari cars in both the design of the theme park buildings and the activities on offer. 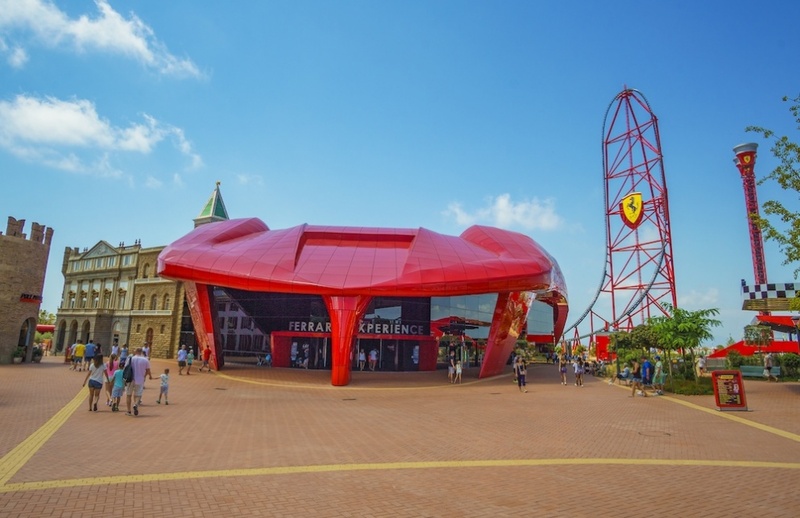 Ferrari Land is an interactive fun park where one can experience first-hand on the rides and simulators available the feel and thrilling, adrenalin rush excitement of the fast acceleration and high speed performance of this iconic Italian brand’s sports cars and Formula 1 racing cars. 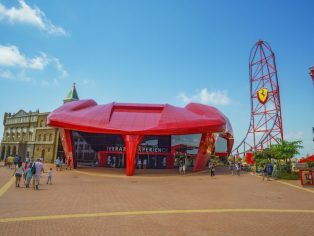 The theme park has two key landmarks, namely the spectacular ‘Ferrari Experience’ building with its instantly recognisable classic Ferrari red coloured exterior and car bonnet shaped entrance, and ‘Red Force’ which is now Europe’s tallest and fastest rollercoaster at over 112 metres tall, accelerating to 112mph in a breathtaking five seconds; riders experience up to 1.35 G-force and virtually the same conditions felt by a Formula 1 racing driver. Both constructions were fabricated using a combination of painted flat aluminium panels and more complex, curved FRP composite wall cladding and roofing sections. Altogether, the FRP composite parts supplied covered approximately 1.500 sq. m., installed on the exterior of the Ferrari Experience building and various sections of the Red Force rollercoaster ride. A total of 800 individual FRP parts ranging in sizes from 0.5 to 5.0 m2, were hand layup moulded by specialist architectural façades and parts fabricator Look Composites at its 44,000 m2 purpose built factory in Alicante, in the south east of Spain. All the moulded FRP parts were supplied to the contractor ready for priming and painting; as the buildings used both aluminium and FRP cladding panels, to ensure identical colour matching of dissimilar material, all the sections were spray painted as a second stage by a specialist local company. The FRP composite panels supplied had to meet the Euroclass B,s2,d0 fire specification stipulated for this construction project. In order to meet the stringent EN 13501-1 ‘Euroclass’ B,s2,d0 fire performance rating stipulated, all of the FRP composite parts needed were custom moulded by Look Composites using Crestapol 1212 resin with Alumina trihydrate (ATH) fire retardant filler. According to the EN 13501-1 Euroclass fire performance specification, a ‘B, s2’ rated material is classified as making a ‘very limited contribution to fire’ with a low smoke growth rate index (SMOGRA) of ≤ 180m2.s-2, with the material achieving ‘d0’ indicating no flaming droplets or particles within 600 seconds of burning. Many European Union (EU) member countries have now adopted the harmonized Euroclass system to classify and compare the reaction to fire performance of building products. The moulding phase of the project took Look Composites eight months to complete, with finished moulded FRP parts delivered in planned stages to the construction site. The 800 complex shaped composite parts needed were very challenging to mould to the size, design and dimensional accuracy required; each FRP part had either a double curvature design, or were non-linear with curves and tight angles, all with moulded fixing point flanges. The first challenge for the Look Composites team was to design and fabricate all the composite tooling for the very wide variety of differently sized and shaped curved parts. Vitally important was the accurate positioning of the moulded FRP flanges on each part to ensure that when each wall cladding and roofing section was mechanically fixed onto the building framework, it exactly lined up and fitted into place. Developed with processability as a key requirement, Crestapol 1212 resin enables hand layup and infused moulded FRP parts or pultruded profiles to be rapidly produced due to a combination of the resin having a very low viscosity with a fast ambient temperature cure rate; depending on the complexity of a part, demoulding can take place as soon as the peak exotherm has been reached. Crestapol 1212 resin also gives moulders the flexibility to adjust ATH and accelerator levels as needed, depending on the application and working times required. According to Scott Bader, the inherent toughness of a cured Crestapol 1212 resin matrices results in laminates exhibiting excellent mechanical performance despite the presence of high levels of ATH filler. Published mechanical properties data for a fully cured, unreinforced Crestapol 1212 resin (according to BS2782) include: deflection temperature under load (1.80MPa) of 87 oC; tensile modulus of 2.7 GPa; tensile strength of 65 MPa; elongation at break of 5.1%. The building designs and specifications for this theme park were developed by Permasteelisa España S.A.U., based in Madrid, which also managed the building construction project. This included handling the production of the aluminium cladding panels, overpainting of the aluminium and FRP parts, and on site installation, working in close cooperation with Look Composites and other specialist subcontract companies engaged on the project. Composite materials for cladding buildings are now established as cost effective, lightweight alternatives to steel, aluminium, fibre cement, terracotta and ceramic based products, which in some applications are supplied as finished parts with a coloured, FR rated, UV resistant gelcoat, so eliminating the need for a secondary painting process. The growth in demand for using different building materials and exterior cladding technologies, according to independent research, is driven by new buildings needing to provide environmental benefits, such as better moisture management and energy savings to meet ‘green’ building regulations. 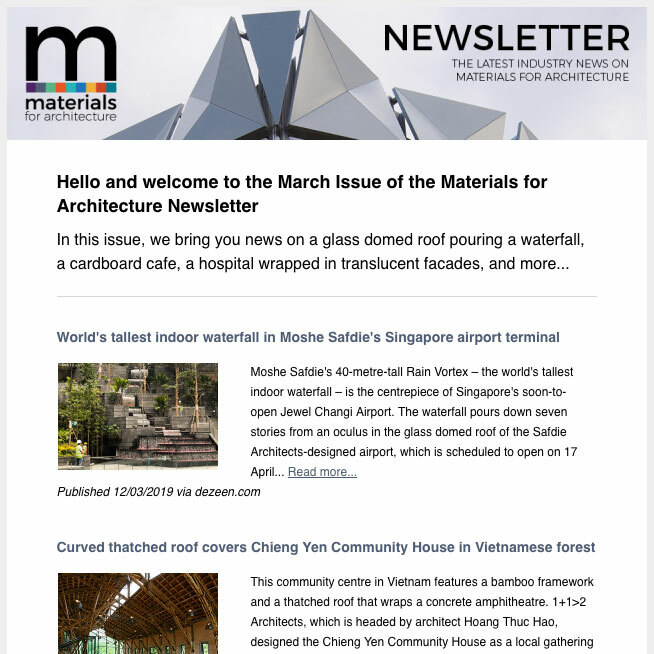 Alongside this greener construction market trend shift, more architects are embracing the design freedom offered by composites to include complex, curved shapes. The combination of these two key factors will almost certainly see the use of composite materials continue to grow in building cladding and roofing applications in the coming years. Altogether, the FRP composite parts supplied covered approximately 1.500 sq. m. of the new Ferrari Land theme park in Spain. 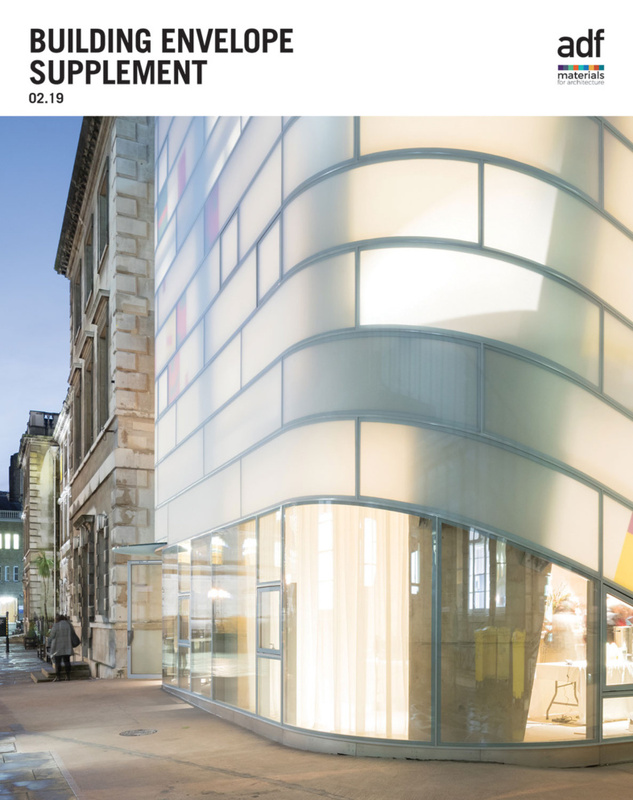 As the buildings used both flat aluminium and curved FRP cladding panels, to ensure identical colour matching of dissimilar material, all panels were spray painted as a second production step. In order to meet the EN 13501-1 ‘Euroclass’ Bs2.d0 fire performance standard, Look Composites specified Crestapol 1212 resin with 170 phr by weight of Alumina trihydrate (ATH) fire retardant filler for all of the FRP composite parts supplied for the Ferrari Land construction project.